Mark your calendars. In just over a week, our 2018 Campaign Exclusive Content will be available in print (and pdf) for 3 days only. From April 19 - 22, we're celebrating my dad's birthday with this special, limited opportunity, as well as some more, exciting things coming up. Visit our Book of Many Things page to see previews of this content. Name’s Games brings to life your content the way you want. By joining us as a patron, you get exclusive previews of content we are currently working on for the Pathfinder Roleplaying Game and 5e, as well as a chance to contribute your own ideas and content. Weekly previews of content available. 8 pages/month of player and GM options. Up to 20 pages of content, collected in a nicely formatted, edited, and updated pdf. Get a 200 page collection of content in a completed volume of work that includes a combination of Patreon only options and previewed content from other volumes, as well as a discount for other books we offer through PDF. Have an idea of your own that you want guaranteed? We'll work with you to create a 4-page spread dedicated to you or somebody of your choosing. When it's done, you'll receive the pdf or print copy of the book and pdf in which it's contained. See tier for more details. We've been hard at work again, and this time, we're putting together a hilarious collection of options just crazy enough to warrant their own book! The Decidedly Laughable Collection features some of the oddest requests and ideas we've had to date, and just like our other volumes, we're going to keep pumping it full of even more laughable content on our way to 200 pages. So set your calendars, because if you want dinosaurs, this is how you get dinosaurs. Details available on our Book of Many Things page. 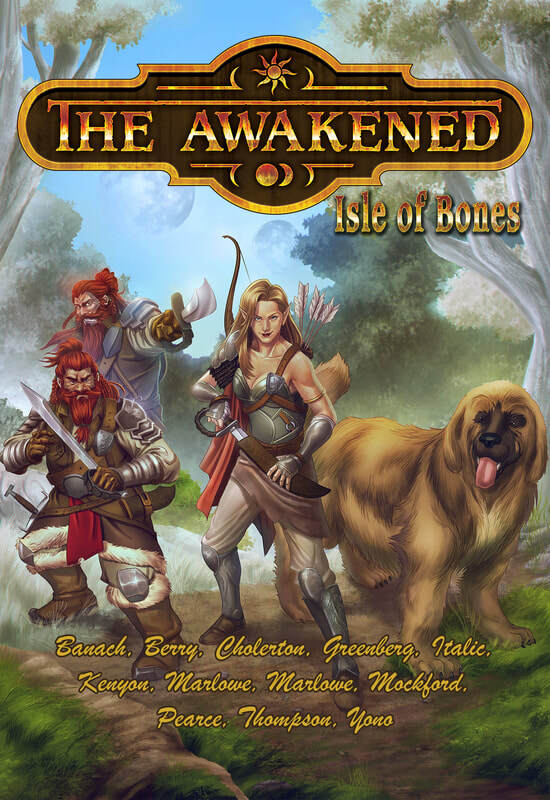 Check out our updates on the Isle of Bones Kickstarter page. The world of Grimaton's about to get a little bigger. Join us as we journey to a new island, where fantastic races are awakened to extraordinary powers and animals find themselves linked forever to a dwarven, elven, gnomish, or even orcish companion. A greater evil threatens the Isle of Bones in the form of Bael Zorn, the Necromancer. Where his influence lies, the world itself is wrought of color, and only a scant few dare to defy his will and the strength of his undead army. 10 new stories collected from different authors tell the tales of the island, and through their experiences, you can learn more about the non-human races of Grimaton. Details available on our The Awakened page. 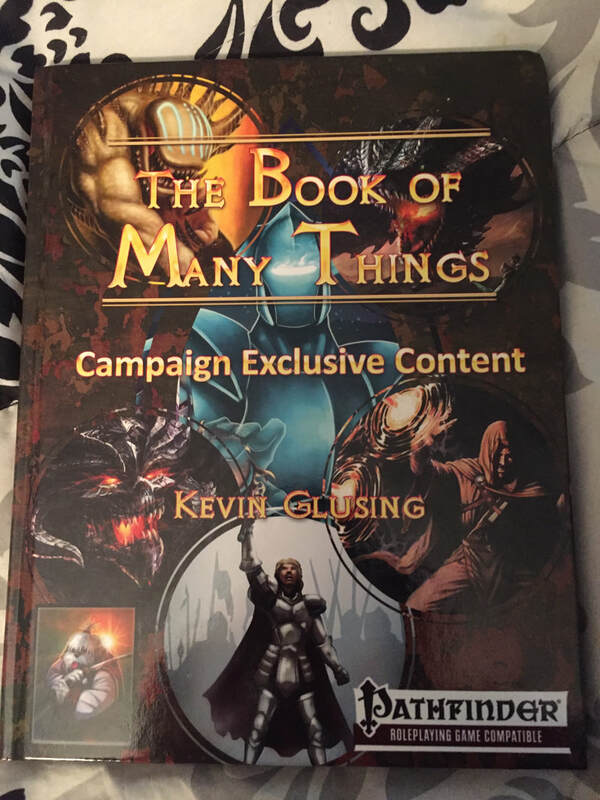 The Book of Many Things Volumes 1 and 2 Kickstarter Complete! Update - 3/25/2019: The signed copies of the books are on their way! 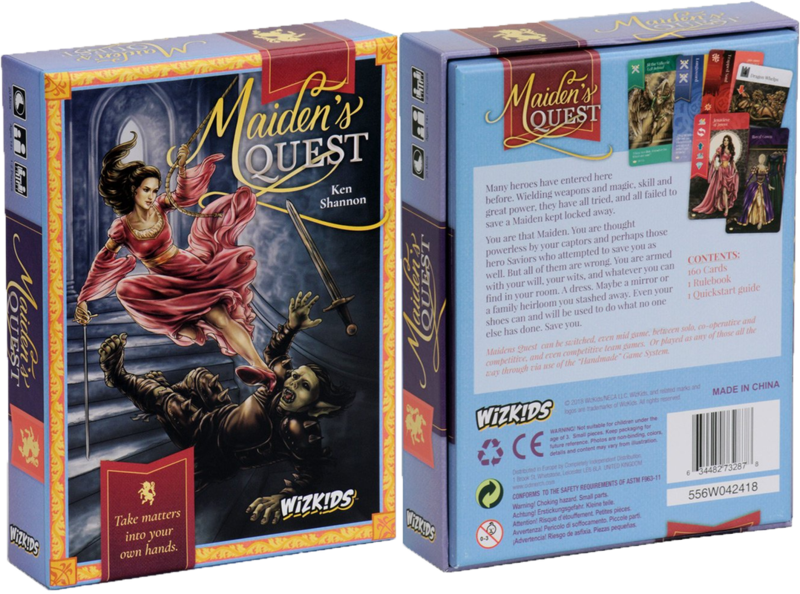 Maiden's Quest by Ken Shannon - Now on Amazon! Click the box above to go straight to ordering on Amazon. It’s dangerous to go alone, so step into adventure with a new collection of character options for the Pathfinder Roleplaying Game. 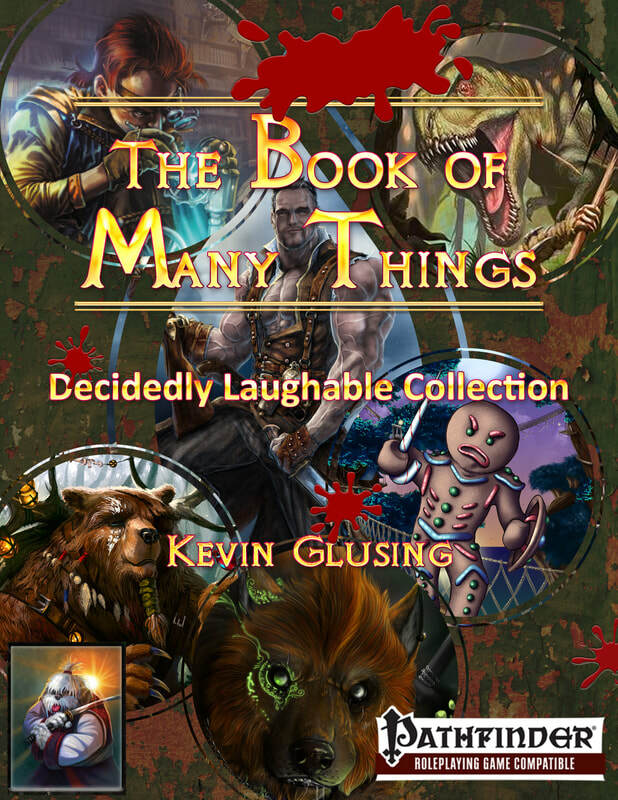 The Book of Many Things Volume 2 is the latest endeavor to build fan requests from around the world. Inside is a compilation of races, classes, archetypes, and more drawn from different mediums and made playable. Recreate favorite heroes, villains, items, and spells, or blend ideas to create something that is entirely different. From large, overly tired cat people, to dragon-souled mercenaries skilled in mutagens and minor magic, the sky’s the limit. You could even be an outlaw, beast master, or shadow priest. So grab your gauntlet and magic fairy bottle. Check that you’ve remembered the monsters in your pocket, and break your limits as The Book of Many Things reaches for the stars. 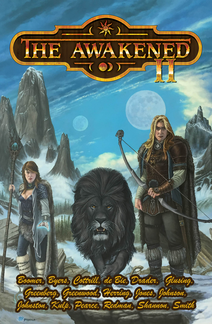 The Awakened II is now available on Amazon: CLICK HERE FOR LINK! 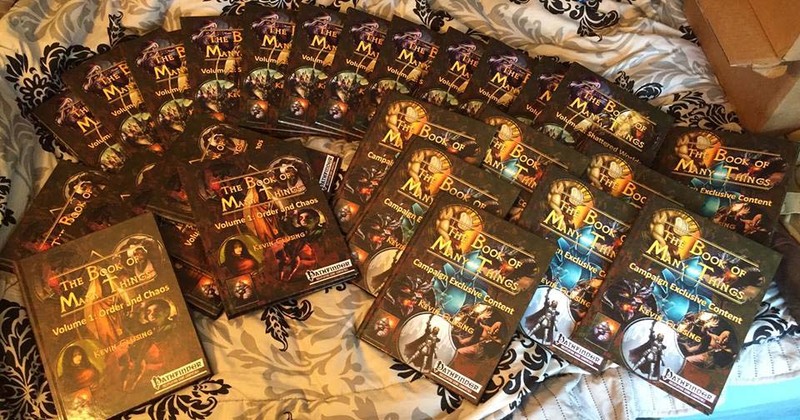 Our Mystic Eye Games Classic Collection is back at Drivethru RPG. Once we have our library uploaded, we will have those in stock on a permanent basis. Awakened II ARC's Are Out!!! The Awakened II will be launched on Kickstarter in mid-June, we are self publishing so the book will be done and ready to release to backers as soon as the monies clear, at that time we will send the book to the printer for the paperback and limited edition hardcovers as well, so the turn around to fans should be much quicker. We are very excited about this and hope you join us in helping fund this long overdue project. The ARC's or advanced reader copies were sent to the authors for final approval, so we are moving along at a very advanced pace. Want to know the latest? Go on over to the Awakened FB page and like it for updates and giveaways!! Click Here for The Awakened FB Page!!!! Now available from Samurai Sheepdog: The Wayfaring Guide to Haven. No time to detail out a village for your party to visit or call home? Haven offers them exactly that. With a collection of craftsmen able to create most mundane equipment, a resident wizard, and the helpful cleric who runs the Head on a Pint Inn, Haven makes for an interesting home away from home. But Haven is more than just a small getaway. It also plays host to a world-spanning competition known as the Tournament Grounds. Your group can sign up for the next, or be inadvertently thrown into it when they kill another participant in battle and claim its tournament stone. The Wayfaring Guide to Haven offers several adventure ideas on both a large and small scale, npcs, maps, and rules for tournament stones. Check it out, or it'll be your head on a pint! Foul Locales Revisited: Pathfinder and 5e compatable! Foul Locales Revisited It appears like we will be relaunching our Foul Locales line as small pdf's that will go on sale once/twice a month for Pathfinder and 5e, all new but keeping with the same style that made it so popular for 3.5 by Mystic Eye Games. The Awakened II-Self Published and Kickstarted! Samurai Sheepdog has decided to self publish The Awakened II since the previous publisher has decided to no longer move ahead and publish books. We will Kickstart this project, more details to follow. The writing is done, the editing is wrapping up and the cover is completed, so we are able to go to print once it successfully funds!